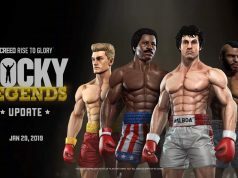 Survios, the studio behind Raw Data (2017) and Sprint Vector (2018), debuted a new single player VR game this year on the GDC expo floor, an upcoming arcade boxing title that puts you in the shoes of Adonis Creed, son of Apollo Creed and protegé of Rocky Balboa. It’s hard not to stop and gawk at people playing Creed: Rise to Glory in pair of actual boxing rings on the expo floor. While a small crowd of curious onlookers formed around the side-by-side rings, we got a chance to record a first look of the game in action. The demo first puts you in the gym with a lifelike Sylvester Stallone where you train with heavy bags and punching dummies, each their own minigame. 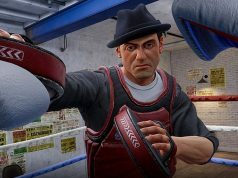 Later you’re tossed into the ring to experience the game’s unique desync mechanic which not only slows down your in-game boxing gloves as you lose stamina, but can knock you completely out of your body if you get staggered or even knocked out. Check out our heart-pumping hands-on with Creed: Rise to Glory from this year’s GDC. 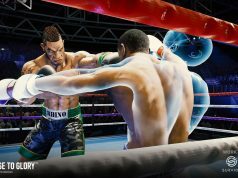 Survios hasn’t announced which platform the arcade boxer will hit when it arrives later this year, although we’ve seen it demoed both on Oculus Rift and HTC Vive. Looks like it could be a lot of fun. Looks decent but what i’d really like to see is a less ‘arcadey’ boxing game.A Fight Night VR would be perfect. I have actually had a blast with Thrill of the Fight through steam on my Rift. I lost 10 lbs already, and am having a blast with it! Creed will be a day one purchase. I agree with the comment below though. The first company that comes up with a “true to life” boxing sim is going to make millions… Call it ROCKY VR — Getting up in the morning and running on the spot, but actually running through Brooklyn. Having people cheer you as you run by screaming “GO ROCK!” — Sitting in pre fight conferences with Apollo Creed and watching the cameras go nuts, then getting into actual fights. It would be awesome. EA BRING IT ON! Did you try BOX VR ? I think it’s the perfect training/warm-up for Thrill of the Fight. This looks like a good game. Man, I’m excited about the phantom boxing system thing Survios is planning. I liked everything besides the music you added.